Various shoots of multihued grass stands within a cushion of soft blooms and green leaves with this artificial fall hydrangea and grass arrangement. 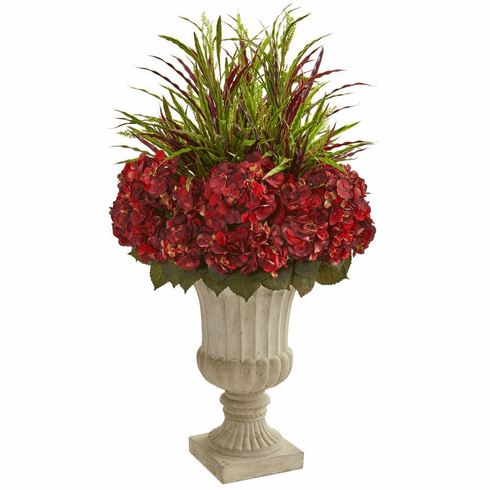 Coming in a classical stone urn, this piece will give any room a chic appearance. Settle it in your living room on top of an end table and next to your couch or between two chairs opposite the couch to accent these spaces. Height: 43 In., Width: 22 In., Depth: 22 In., Color: , Pot Size: H: 20 In. W: 14 In. D: 14 In.